It’s the job of The Colony Communications Department to help make sure they do. A recent column by Director of Communications Diane Baxter in the neighborsgo section of The Dallas Morning News highlights the many methods used to get the word out about what’s going on in the city. While engaging with and informing residents and the public at large on social media and other platforms is an important part of what we do (this blog included), it’s by no means all we do. Among our primary responsibilities is assisting The Colony City Council with media relations. For example, Baxter traveled with Mayor Joe McCourry earlier this year to a restaurant in a neighboring city for a live, on-location interview with KRLD-1080 radio. It was a great opportunity for the mayor to share information about all that’s going on in The Colony with the station’s greater DFW listening audience. 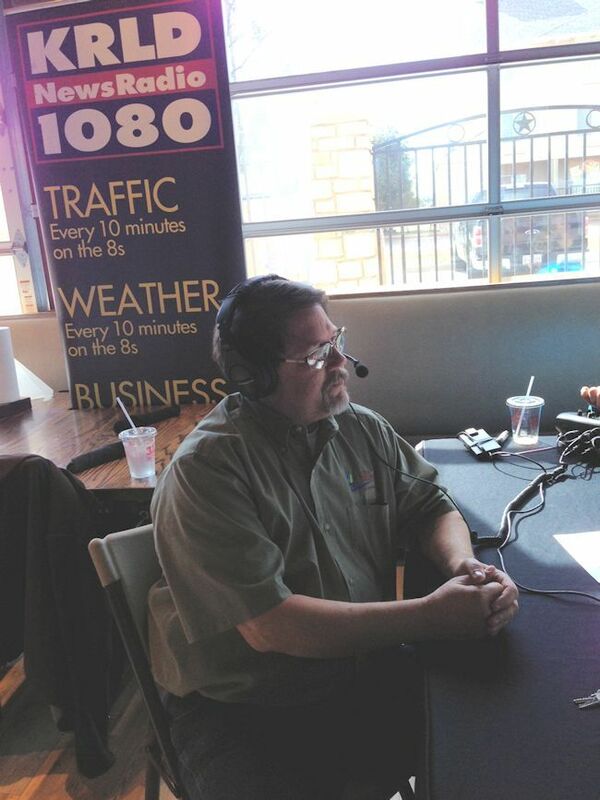 Mayor Joe McCourry visits with KRLD-1080 radio to discuss development during a live interview. Communications staff members most frequently field calls from print media, specifically reporters from neighborsgo and The Colony Courier-Leader. We do our best to provide them on-the-spot answers to their queries but often the process requires additional phone calls internally to track down the facts or we put them directly in touch with a department director or employee best qualified to go on the record. Circumstances more often require the reverse scenario in which we’re reaching out to the media to make sure they know about an important news event or traffic advisory. For example, emergency services crews recently responded to a gas leak in an alley behind Strickland Avenue. The leak was repaired quickly but some residents in nearby homes were evacuated. We post updates regarding such events on our own channels but it always helps when the media can get the word out, too, in order for the information to reach as many people as possible. This initiative doesn’t usually involve breaking or emergency news. Often times we just want to excite the public about a special event. The City Manager’s Arts Committee recently announced the dates for this year’s Jammin’ in the Park series, taking place the next three months at Lion’s Club Park. In addition to postings on social media, we make calls to our contacts at neighborsgo and Star Local Media in the hopes they’ll add the item to their events calendars. 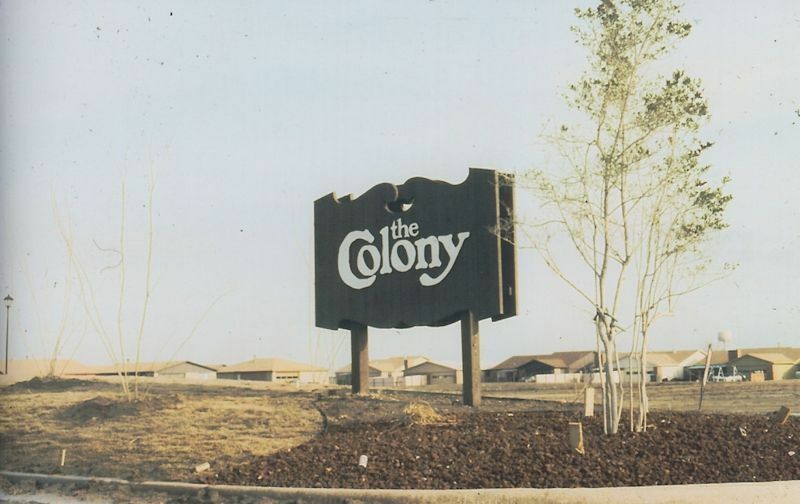 This picture of a sign from the city’s early history, labeled ‘Olde Days’ in the archives, was posted on social media on Throwback Thursday. The posting has, to date, been the most popular and engaging content shared on the city’s accounts. We also look for opportunities to promote noteworthy achievements by our employees. Assistant Police Chief Chris Chandler and Officer Kelly Nichols will be taking part in a charity ride in May benefiting Team Texas, an organization that supports the families of fallen police officers. As a charity event, it’s important the public know about it in advance in order to maximize the fundraising opportunity. Again, we pitch the story to the local newspapers as well as some television reporters who might be looking for a feel-good story. An important part of this job is understanding how the media operates. “Between myself and Communications Specialist Blaine Crimmins, there are decades of industry experience on our staff which enables us to anticipate the needs of the media and provide them with content we hope they will find newsworthy,” Baxter said. Our office also monitors social media accounts and websites of many news outlets, during which we often come across stories about our community. We’re understandably proud of Grandscape, our new development on SH121, and we regularly watch for news and updates about the project we can share on our own social media. This is exactly the kind of news we want to share with our residents so they can look forward to reaping the benefits of our growth while undergoing growing pains. 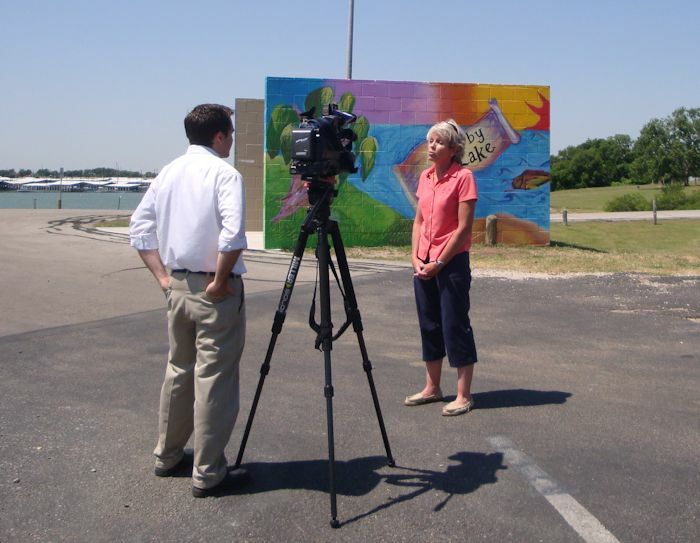 Director of Community Services Pam Nelson, right, is interviewed by NBC5 reporter Brian Scott regarding student-painted murals at Stewart Creek Park. Beyond media relations and analysis, communications staff members share responsibility with the Information Technology Department for maintaining the accuracy and functionality of the city’s website. There are more than 200 pages on the site, all of which require steady monitoring to ensure information looks fresh and is up to date. We also manage the content and troubleshoot the software for the city’s cable broadcast; draft and edit all manner of press releases for every department in the city; take photos; and field calls from residents and help make sure they find whatever information they need. At the end of the day, good communications is about relationships, both inside and outside the organization.